We currently have two types of regular meeting: Sunday afternoons and mid-week homegroups. See a list of upcoming regular events or check the calendar to find out when and where we’re meeting next. On Sundays at 11:00am, we meet at St. Joseph’s College at 74 Wellesley St West (just west of Bay) for worship. It is completely come as you are—we don’t expect you to dress or act a certain way to join us. 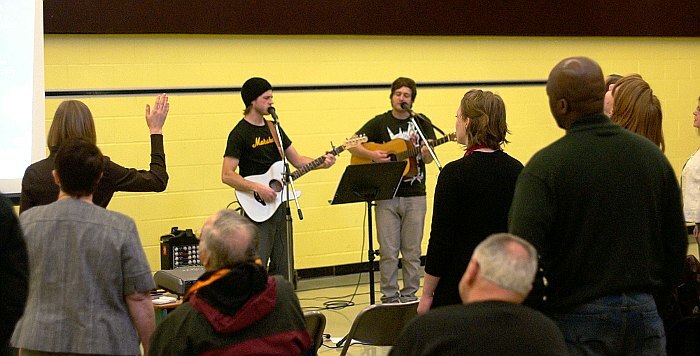 Typically we begin with half an hour to 45 minutes of worship, with musicians leading us in songs of praise to God. Everyone is encouraged to join in with prayer, Scripture reading, or other contributions as they feel led by the Holy Spirit, to bless others and to honour God. After the time of worship we break for a few minutes to give people time to greet and get to know one another. We then have a time of teaching from God’s word. At any point during our meeting we may take time to pray for particular needs, such as physical healing or other requests. After the meeting we usually stay around for tea and coffee, food, and fellowship. A typical homegroup includes songs of praise to God, with opportunity for everyone to join in by praying or sharing anything they feel God has given them; discussion, usually about the previous Sunday’s sermon; prayer for one another; and tea, coffee, and refreshments. Everyone is welcome! Occasionally we may have conferences or other special events.